The Fed is unlikely to make any new comments at all after its meeting Thursday, but that could cause rates to rise in the bond market. Bond strategists say some market players may be looking for the Fed to give a nod to the market volatility that drove the S&P 500 down nearly 7 percent in October. The Fed's statement, at 2 p.m., is expected to keep the Fed on track for further rate hikes, and that could send the 2-year Treasury yield higher, to a new, more than decade peak. Federal Reserve Board Chairman Jerome Powell testifies during a hearing before the Senate Banking, Housing and Urban Affairs Committee July 17, 2018 on Capitol Hill in Washington, DC. The Federal Reserve could make no new comment at all after its meeting and still sound hawkish, sending the bond market into a tizzy. "If the Fed reaffirms that it's going to keep going after all that stock market noise in October, people may say, 'Hmm, we didn't really expect that,'" said Michael Schumacher, director rate strategy at Wells Fargo. Bond strategists mostly expect the Fed to sound just like it did after its last meeting,ready to roll with its rate-hiking plans, when it issues its post-meeting statement at 2 p.m. That means another rate hike would be coming in December and the Fed sticks with its forecast for three more next year. "I think the front end of the market will sell off and the long end will stay stable," said Ian Lyngen, head of U.S. rate strategy at BMO. A nod by the Fed to recent market volatility would be seen as dovish and be interpreted as a sign of caution, suggesting the Fed might be less willing to proceed with as many interest rate hikes as it has forecast. Many Fed watchers expect fewer rate hikes next year than the Fed has forecast. But Lyngen said the Fed is not likely to mention recent volatile markets, and that could be taken as hawkish. The S&P 500 was down about 7 percent in October. The 2-year Treasury yield, at the front end of the curve, is most reflective of Fed interest rate policy. 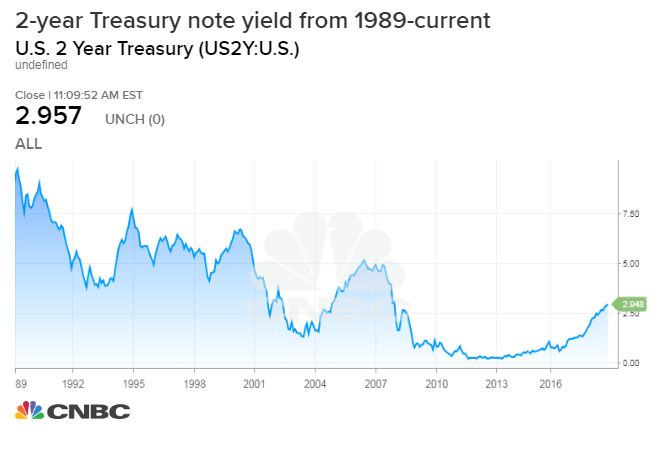 That 2-year note was yielding 2.94 percent Thursday, after reaching a more than decade high of 2.96 percent after the election Tuesday evening. Lyngen said that yield could easily touch 3 percent in the near future and at least reach a new cycle high after the Fed meeting. The 10-year note, at 3.21 percent Thursday, is expected to make a more muted move. That would mean the curve, or spread between yields, would be 'flattening' as the long end yield and short end yields move closer together. The benchmark 10-year is tied to a wide range of business and consumer loans, including home mortgages. The Federal Reserve's rate-hiking policy has been driving a flatter curve. But there is concern in the market as it continues to narrow because a truly flat curve leads to inversion, meaning short end rates rise above long end rates. That phenomena has been a reliable signal for oncoming recessions. The Fed on Thursday is expected to leave the fed funds rate range at its current 2 to 2.25 percent level, but raise it when it meets in December by a quarter point. There was some speculation the Fed could make a technical tweak to the interest rate on excess reserves as it did earlier this year, but that is mostly seen as unlikely for the November meeting since there is no press briefing.